Grocery stores. Coffee shops. Even some cities offer public WiFi. Add to those access points the number of private WiFi networks that exist and it’s easy to understand why the allocation and usage of the electromagnetic spectrum — the number of “channels” available for wireless communication — is stretched to its limits. The impending demand of machine-to-machine (M2M) and Internet-of-Things (IoT) devices will put even more of a strain on spectrum usage. Possible solutions to this problem, such as dynamic spectrum access and cognitive radios, have been proposed but their success is based upon a more efficient use of the spectrum. A team of researchers led by Wolfgang Porod, the Frank M. Freimann Professor of Electrical Engineering and director of the Center for Nano Science and Technology at the University of Notre Dame, is putting a new “spin” on this issue, one that could significantly improve the efficiency of radio spectrum utilization [access and processing] while at the same time providing improved energy efficiency within devices. It’s a new way of processing millimeter-wave and microwave information using spin waves in magnetic thin films. “Spin” is a property of electrons that makes them act like tiny bar magnets (or compass needles) the size of individual atoms. Just about every modern electronic device – such as computers, printers, smart TVs and, of course, cell phones – has the built-in capability to communicate wirelessly. Today, nearly all electronics are based on electrical, rather than magnetic, interactions. The Notre Dame team is pioneering the use of magnetic phenomena for information processing, exploiting the unique properties of spin waves. 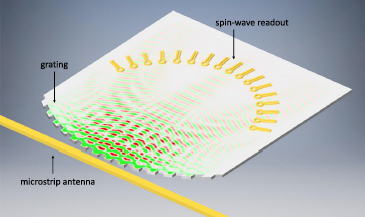 Spin waves operate at the same frequencies as the electrical interactions used for wireless communications, and they employ much less space than would be required for conventional electronics. This offers the possibility of very compact devices, low-energy processing, and high signal integrity. Initial results indicate that this new technology could enable the replacement of today’s bulky passive electromagnetic systems with smaller [chip-scale], lower-power, higher performance devices. An article in the most recent issue of Scientific Reports describes the Notre Dame team’s design of a nanoscale spectrum analyzer based on spin-wave interference. The results of simulation studies of that design suggest that all performance figures of the team’s magnetoelectric device (speed, area, and power consumption) are potentially order(s) of magnitude better than what is achievable in a purely electrical system at room temperature. Schematic layout of the proposed Notre Dame spin-wave-based spectrum analyzer. Based upon this proposed device concept, the team has been awarded a $690,000 grant from the National Science Foundation (NSF) to build a prototype micromagnetics-based real-time spectrum sensor that is low-cost, high-performance, and chip-scale. This experimental team includes Gary Bernstein, the Frank M. Freimann Professor of Electrical Engineering and Research Professor Alexei Orlov and Assistant Professor Jonathan Chisum, also in the Department of Electrical Engineering. In addition to the research, the NSF award will support the training of students in this new technology and graduate students exploring commercialization through University of Notre Dame’s Innovation Park and the Engineering Science and Technology Entrepreneurship Excellence Master’s Program. Local high-school teachers and faculty from the South Bend campus of Ivy Tech Community College will also participate in the work through an NSF Research Experiences for Teachers program. While much of this work will occur on campus, this project is being conducted in collaboration with Professor György Csaba at the Pázmány Péter Catholic University in Budapest, Hungary, and is based on the doctoral thesis of Adam Papp, a Hungarian student who is the first in a new joint Ph.D. program between the Notre Dame and the Pázmány Péter Catholic University. Originally published by Nina Welding at conductorshare.nd.edu on September 27, 2017.